Lochaven has sewn up the market in dressing Hollywood stars from the silver screen, most notably the "Harry Potter" blockbuster movies starring Daniel Radcliffe, Emma Watson, Rupert Grint and Robert Pattinson to name but a few. In 2001, Warner Bros. chose Lochaven to supply all the Hogwarts school cardigans, jumpers and tank tops worn by the cast and extras in the iconic Harry Potter film series. The changing styles throughout the film series was facilitated by access to Lochaven's vast design range which dates back to the 1950's. Retro flashback scenes from Harry Potter and the Chamber of Secrets and Harry Potter and the Half - Blood Prince were shot using retro knitwear made by Lochaven for the character Tom Marvolo Riddle played by the actors Christian Coulson and Frank Dillane. In Harry Potter and the Order of the Phoenix James Potter, Sirius Black and Severus Snape as teenagers are also seen wearing Lochaven's retro garments. 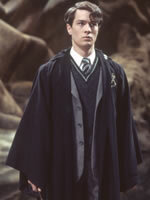 Our involvement continued with the supply of clothing for Harry Potter and the Deathly Hallows - Part 2. In 2009, due to the success of the movies and the high profile of the Lochaven branded products being worn by the cast, Lochaven offered the products to the public for the first time. In 2010, Lochaven and Warner Bros. launched a licensed Harry Potter branded version of our product which is available from merchandise retailers around the world. Our product is also on sale at The Wizarding World of Harry Potter at Universal Studios, Orlando, Florida and at Warner Bros. Studio Tour London - The Making of Harry Potter.